This recipe is one of my ‘pages to plate’ projects. At the beginning of Harry Potter and the Goblet of Fire, Mrs Weasley made a chicken and ham pie that Harry Potter thoroughly enjoyed at an outdoor summer meal before returning to Hogwarts for the year. Ever since I first read about that meal, I have maintained a fondness for the idea of chicken and ham pie. I have made a previous attempt at making it, but decided that, in the spirit of summer, the pie needed to be made in the style of a picnic pie, like an English pork pie, and served cold. This recipe hit the mark precisely. Not only is a slice of this pie perfectly delicious served with a little pickle or chutney, like a simple ploughman’s lunch, but I find the experience as joyful and reminiscent of that summer evening so enjoyed by Harry. The filling for this pie includes chicken thighs because they’re the tastiest part of the bird and less prone to drying out than the breast. I pulled the ham meat from the hock I used to make the savoury jelly. I coarsely minced these two meats in my Grandma’s old fashioned meat mincer. I love the texture this gave. If you have not been blessed with such an inheritance, you can use chicken mince or ask the butcher to mince your chicken for you and chop the ham pieces with a knife. The meat is seasoned with some traditional herbs and spices: allspice and mace, as well as sage and chive. Mace blades come from the outside of the nutmeg and have a milder flavour that is delicious with chicken. I also used both black and white peppers. I found the combination to be a perfect, subtle enhancement of the flavour, adding a little complexity to the pie without overpowering the flavours of the key ingredients. The recipe makes far jelly than you’ll need for this pie. Freeze any leftover and use it to make delicious soups like my rustic bacon, leek and potato soup. I based my pastry on the hot water pastry recipe the Hairy Bikers gave for their Melton Mowbray Pork Pie. I didn’t have enough lard for their recipe, so I did have to substitute some butter, but I don’t think I’ll use this recipe again. It was nowhere near as malleable as I wanted it to be, making it far too difficult to work with. This meant I couldn’t help the formation of holes in the pastry, which lets any liquid filling seep through the pastry. This is not acceptable for this kind of pie that needs to hold onto the savoury jelly till it sets. 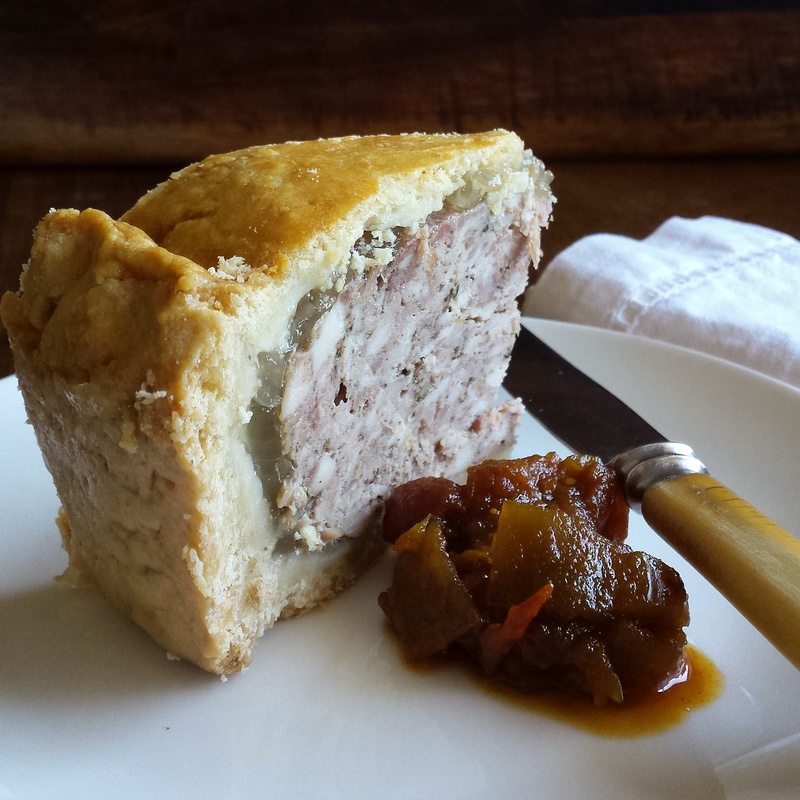 Next time I’ll try the pastry from the Raised Pork Pie recipe in BBC Good Food, written by Valerie Barrett. I’ll update this post once I’ve tested that recipe. *I used some thigh bones from which I’d cut the chicken for the filling. You could use chicken carcasses, other chicken bones or omit them entirely. **Use whatever else you have around, or can get your hands on easily. I store vegetable scraps (peelings, tops and tails etc) in a ziplock bag in my freezer for whenever I want to make stock. I threw them in my pot here. That selection included turnip, swede, parsnip and celeriac. To make the jelly, place all the ingredients in a large saucepan and cover them with water. Simmer gently for several hours, being sure the pan doesn’t boil dry. When the trotter is falling apart, turn off the heat. Strain the liquid from the solids. Retrieve all of the ham hock. When the hock is cool enough to touch, remove and discard the skin, bone and fat. Reserve the meat pieces for the filling. Discard the remaining solids (throw out the trotter and compost the vegetables). Allow the liquid to cool. It should set to a jelly firm enough to slice with a knife. If it doesn’t, return it to a pan and reduce it down to a concentration that will set. To make the filling, pass the ham pieces through the course setting of a meat mincer, or chop them roughly and place them in a large mixing bowl. Chop the chicken thighs into pieces and pass them through the course setting on the meat mincer and add them to the minced ham. Add all remaining ingredients and mix thoroughly. Place the filling in the fridge until required. To make the pastry, heat the butter, lard, milk, water and salt in a saucepan until the fats have melted and the liquid is piping hot. Meanwhile, sieve the flour into a medium sized bowl and make a well in the centre. Pour the piping hot liquid into the well in the flour and mix well with a spoon. When the mixture starts to come together, form it into a ball. When it’s cool enough to handle (you want it to still be pretty warm) knead it to smooth dough. Cut off less than a quarter of the dough and reserve it in a warm place to make a lid. Roll the remaining dough out to make your pie case. To assemble the pie, preheat the oven to 200oC. Lay the rolled pastry into a pie or baking dish that is about 20cm in diameter and nice and deep, maybe 5-10cm. Be careful to make sure there are no holes in the dough. Form the filling into a large ball and place it inside the dough case. Roll the remaining dough out to form a lid. Place the lid on top of the meat filling and carefully crimp the lid and sides together to seal in the filling. Using a knife, apple corer or small cookie cutter, cut a hole in the middle of the lid. Bake the pie at 200oC for 30 minutes then turn the oven down to 150oC to bake for a further 45 minutes. Remove the pie the oven and allow it to cool. Warm the savoury jelly through so it just becomes liquefied again. Gently pour the jelly through the hole in the top of the pie (I used a funnel) until the jelly reaches the top of the pie. Refrigerate the pie overnight, or till the jelly is set. Serve a slice with your favourite pickle, relish or chutney. This entry was posted in Lunch and tagged children's literature, Harry Potter, Pages to plate, picnic, pies, pork, poultry. Bookmark the permalink. There are definitely delicious and beautifully looks, greet,..!